Sexuality « Eric Anthony Grollman, Ph.D.
A great deal of victimization research has investigated factors that explain differences in fear of crime, including prior victimization, community disorder, and population density. A number of scholars have examined gender differences in fear, consistently finding that women experience greater levels of fear than men. Given the high level of violence against LGB people, particularly anti-LGB violence, it is surprising that no studies to date have considered sexual orientation differences in fear of violence. Doug Meyer and I recently published an article on gender and sexual orientation differences in fear in the Journal of Homosexuality (April 2014). This was the first study to examine whether sexual minority (e.g., lesbian, gay, and bisexual [LGB]) people are more likely to report fear of crime and violence than heterosexuals. In light of the extensive work on women’s heightened levels of fear relative to men’s, we also considered whether sexual orientation differences in fear differed by gender. I briefly summarize our study below. We found that approximately one-third of adults reported being afraid to walk alone in their own neighborhood. As prior research has indicated, women were significantly more likely to report fear than men (44% compared to 19%). 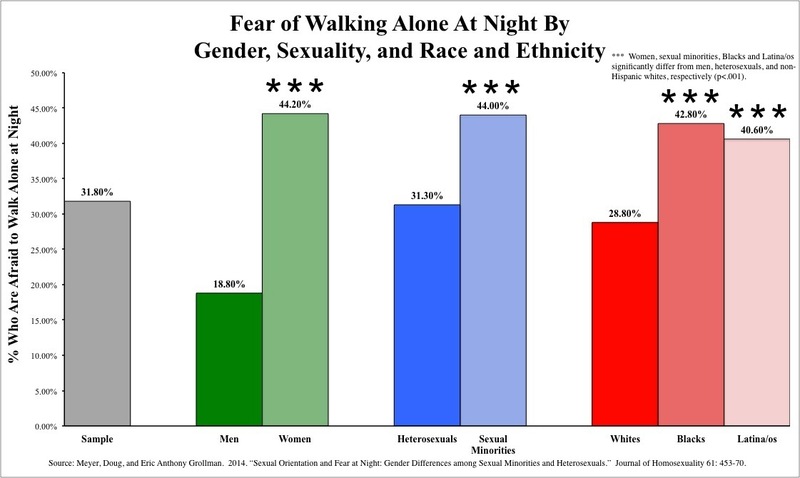 Similarly, sexual minoritiesand people of were significantly more likely than heterosexuals and non-Hispanic whites, respectively, to report being afraid to walk alone at night. These differences are displayed in the graph below. Next, we assessed whether these initial sexuality differences in fear hold once accounting for gender, race and ethnicity, age, education, income, religiosity, urbanicity, and region. Indeed, even net of these other factors, sexual minorities were significantly more likely than heterosexuals to report fear at night. Women and Blacks and Latina/os were also significantly more likely to report such fear than men and non-Hispanic whites, respectively. We found other significant differences, as well: greater fear with decreasing income; and, greater likelihood of reporting fear among Southerners and those living in urban areas. 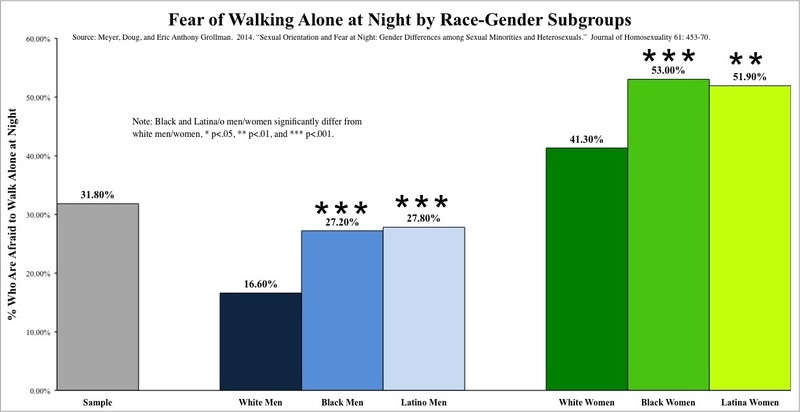 In sum, we found that sexual minorities were significantly more likely than heterosexuals to report being afraid to walk alone at night in their own neighborhoods. Women, people of color, and lower-income individuals also shared this heightened sense of fear relative to men, non-Hispanic whites, and higher-income individuals, respectively. Considering these patterns, we decided to explore the intersections among sexuality, gender, and race and ethnicity in these reports of fear, which I discuss below. 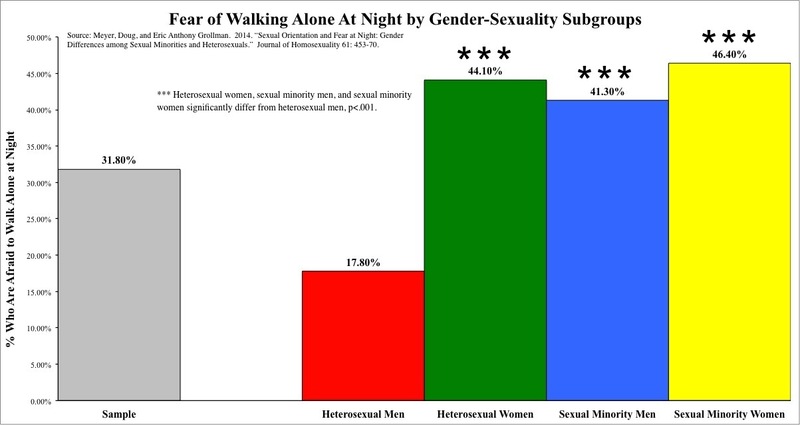 The graph below displays the reports of being afraid to walk alone at night in one’s neighborhood for the four gender-sexuality subgroups: heterosexual men, heterosexual women, sexual minority men, and sexual minority women. Sexual minorities’ and women’s higher reports of fear compared to heterosexuals’ and men’s, respectively, mask the patterns at the intersections of sexuality and gender. The effect of sexuality on fear is gendered, wherein it distinguishes reports of fear among men but not women. Heterosexual women (44%), sexual minority men (41%), and sexual minority women (46%) are significantly more likely than heterosexual men (19%) to report fear at night. However, the three former groups’ reports of fear do not significantly differ from one another. We investigated whether race and ethnicity intersected with gender and sexuality in reports of fear, as well. The graph below displays fear for each racial/ethnic-gender subgroup. We found that the effect of race and ethnicity on fear at night was unique to men once we controlled for the effect other sociodemographic characteristics. That is, like the effect of sexuality, race and ethnicity distinguished men’s but not women’s reports. We were unable to consider simultaneous intersections among sexuality, gender, and race and ethnicity due to the small number of sexual minorities. You can see differences just in percentages, without controlling for the effects of other sociodemographic characteristics, in the graph below. These patterns should be interpreted with caution given sampling constraints. One in six white heterosexual men reported being afraid to walk alone at night in their neighborhoods. That jumps to one in four for heterosexual men of color, and approximately two-fifths of white heterosexual women and white sexual minorities. And, half (or slightly more) of women of color and sexual minority men of color reported fear at night. These differences in fear mirror the disproportionate violence experienced by individuals who hold multiple disadvantaged identities. Using a nationally representative survey, we found that sexual minorities are more likely than heterosexuals to be afraid to walk alone at night in their own neighborhoods. However, this sexuality gap reflects differences among men; substantially more women (both heterosexual and sexual minority) and sexual minority men report fear at night than heterosexual men. A similar gender-specific effect exists for race and ethnicity. Black and Latino men are more likely than white men to report fear at night; however, fear does not differ by race and ethnicity among women once accounting for the effect of other sociodemographic characteristics. Our paper emphasizes the importance of studying the intersections among racism, sexism, heterosexism, and other systems of oppression. Prior research comparing women’s and men’s fear of crime and violence has (unintentionally) assumed that these gender differences hold across sexual orientation, race and ethnicity, and other statuses; however, we found that it appears to be limited to white heterosexuals’ reports of fear. Given the vast diversity among women, as well as men, these groups’ experiences should not be treated as universal. Our other studies highlight the urgent need to attend to the lives of multiply disadvantaged individuals (e.g. Black LGBT people), who are often the most vulnerable to violence and discrimination.